The reverberation chamber creates a multi-functional EMC test chamber for commercial, military and automotive testing applications. Comtest reverberation rooms comply with the IEC 61000-4-21prt 4-21, EUROCAE/ED-14F, MIL-STD 461F, RTCA/DO-160 standard as well as various automotive standards. Comtest’s reverb chambers are used primarily for electrical immunity testing. Reverberation chambers are utilized in commercial, military and automotive EMC testing. If you’re interested in a high-performance reverberation chamber, do not hesitate to contact our engineers for more information. Call +31 71 541 75 31 or use the form on our contact page. A reverberation chamber is a specialized EMC test chamber generating very high field strengths using modest amplifier power. The reflections between the RF shielded walls are optimized to add up to maximum of as many standing waves as practically possible. The chamber is mainly used for testing electrical immunity of test objects (EUT). The RF shielding is established by constructing the reverberation chamber from a 2 mm pan-type galvanized or 3mm aluminum panel system. RF shielded doors and cabling access to the reverberation chamber are specially shielded for RF signals. This ensures that unwanted electrical noise from the outside world does not affect the test results and electrical immunity testing can be made without disturbing the surroundings. When performing EMC testing the reverberation chamber is mode-stirred or mode-tuned by means of a stirrer. A stirrer system is a (large) structure of aluminum plates that is stepwise turned during testing. The objective is to maximize the standing wave pattern in the usable test volume. These EMC tests are statistically evaluated and the “worst case” data are used for the final evaluation of the test result. In addition to immunity testing electrical emission tests or specialized EMC testing in accordance to military, aerospace or automotive EMC test standards can be performed in the reverberation chamber. Comtest reverberation chamber models vary for each Lowest Usable Frequency (LUF). To obtain the best possible results with the stirrer versus chamber dimension Comtest is using different mode-stirrer designs. The LUF80 and LUF100 model is designed with an oscillating wall stirrer. This innovative stirrer is invented by Comtest R&D department and is a patented design. The new and innovative stirrer design achieves higher field strengths and a larger test volume inside the reverberation room compared to traditional stirrer systems. Our LUF200 model uses traditional asymmetric two-pole Z-fold stirrer system. The Z-fold stirrer is vertically mounted in the reverberation chamber. For the smaller RC boxes, starting at 400MHz & 1000MHz an asymmetric pedal stirrer system is used. The pedal stirrer is vertically mounted in the reverberation room and is mounted to the roof only leaving the floor of the reverberation box free for the EUT. And various other automotive standards. The reverberation chamber can also be used for immunity and shielding effectiveness tests as well as for measuring total radiated power. Another application for the reverberation chamber is simulating complex multipath environments like computer rooms and other electrically congested areas. 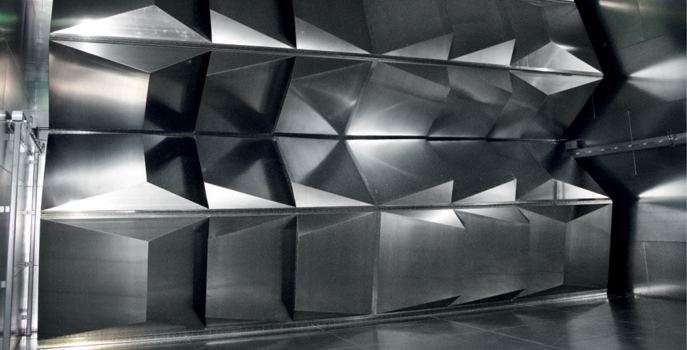 The main advantage of EMC testing in a reverberation chamber over the traditional semi anechoic chamber tests is that less power input is required to achieve the same field levels. The resulting benefit is that expensive amplifier systems are obsolete. Comtest manufactures reverberation chambers in various sizes, all with a specific Lowest Usable Frequencies (LUF). Our typical Reverb solutions vary from LUF 80MHz up to LUF1000MHz. Larger chambers have a lower LUF than small chambers. Check the specification table below for detailed information. Comtest designs and builds chambers for many different clients. If your research requires a specific solution, our chambers can be altered to meet these needs.